An estimated 17.7 million people die annually across the world due to cardiovascular diseases. The workload on radiologists increased by 1300% in number of CT scans interpreted and 540% increase in the MR images. Cardiovascular MRI is required by physicians and radiologists to understand reasons behind a person’s illness and chalk out a treatment process. There are many tools that are available in the market that can be used to view and analyse these MRI results.Some of the existing MRI analysis tools are CVI42, HARP, Sygnovia,etc. We performed data augmentation such as rotation, cropping, image transformation and feature extraction methods using traditional algorithms. We used latest algorithms and Random forest trees for labelling unlabeled dataset. Deep neural networks work better on large datasets else the networks won’t be able to generalize. In Healthcare, finding large labelled data sets is a challenge. Top advantage of our feature extraction method is our algorithms perform extremely well on small datasets. Other learning algorithms requires lot of labelled data set. 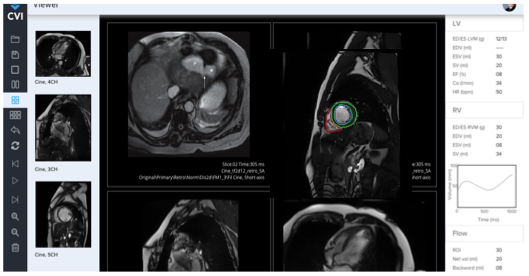 Tech Vedika is currently developing a Cardiovascular MRI Analysis Tool which is powered by Artificial Intelligence.We are currently working on the full ventricular function assessment. The software consumes the entire patient data and separates out the short axis DICOMS. It is capable of fully automatic Deep Learning and Active learning based contour detection, which calculates the ventricular functional parameters. Developed a fully automated segmentation method for MRI images using deep learning. End diastolic volume, Ejection fraction, Heart rate, Cardiac index, Cardio output, Body surface area.